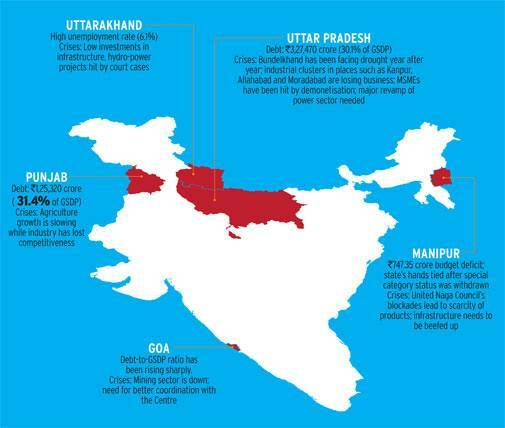 New governments in five states have their task cut out for kick-starting growth. Punjab's new chief minister, Captain Amarinder Singh, took people by surprise when he opted for a simple swearing-in ceremony. It neither suits his personality nor the convention in Punjab. Many thought a grander event would mark Singh's return to power after a decade and that too after a fierce battle. But this move is an extension of Singh's poll agenda. Punjab's economy is in bad shape and needs to be overhauled. The state's outstanding debt, at `125,320 crore, is estimated to be 31.4 per cent of the GSDP. The challenge for the government would be to find avenues to increase revenues while cutting down on expenditure. While agriculture growth has slowed, industry, too, has lost competitiveness. Financial problems are not restricted to Punjab. Among the five states that have got new governments, Goa has also seen its debt-to-GSDP ratio rise steeply. The new government also needs to resolve the mining crisis quickly. With Manohar Parrikar, former defence minister, sent there as chief minister, industry is confident that its issues will be resolved efficiently. In 2012, the then government, led by Parrikar, had banned mining after reports of corruption and irregularities. It was opened in 2014 but in a restricted manner. Parrikar will also need to focus on fiscal numbers. In the last two years, the debt-to-GSDP ratio has worsened from 27.2 to around 31. The unemployment rate, at 9 per cent, is also high. In Manipur, the new government will have to find ways to end the crisis with the United Naga Council. Regular conflicts have led to blockages and shortage of essential commodities. After the 14th Finance Commission recommendations were accepted, Manipur is no longer a special category state. But because of its forest cover, it got higher devolution of funds. Out of `10,500 crore revenue receipts, only `667 crore is from state taxes. No new taxes were introduced in the last two years and revenue receipts are just enough to meet expenditure. This will make things more difficult for Chief Minister N. Biren Singh. The BJP is keen to showcase Manipur as a state where centrally-sponsored projects are well executed to improve its prospects in other north-eastern states. This includes effective and speedy construction of the trans-Asian highway connecting Thailand and Myanmar via Manipur, the Integrated Infrastructural Development Project at Moreh, the Export Promotion Industrial Park project at Khunuta Chingjin in Thoubal district, the industrial growth centre project at Lamlai-Napet, and a food park at Nilakuthi. Uttarakhand's new CM, Trivendra Singh Rawat, is the only one who may find it slightly easier. Among the five, the state has the lowest debt-to-GSDP ratio (24.4 per cent). Uttarakhand also had the lowest fiscal deficit at 2.23 per cent in FY16. But the challenge is to maintain growth. Industry contributes 50 per cent to Uttarakhand's net SGDP. The challenge is to back industry's demand for investments in roads, railways and power. The critical sates are Punjab and Uttar Pradesh. Both Singh in Punjab and the BJP in UP have promised to waive off loans to small and marginal farmers and provide them interest-free loans. The total outstanding against UP's farmers alone is `75,000 crore, of which 10 per cent is from institutions. The Reserve Bank of India has expressed its reservation as this may impact credit discipline of farmers. On March 16, in the Lok Sabha, Agriculture Minister Radha Mohan Singh confirmed that the union government will bear the burden of the UP government. But there is complete silence on Punjab. The state's agriculture is almost stagnant with compounded annual growth of 1.6 per cent from 2004/05 to 2014/15. In the last 20 years, several efforts have been made to diversify, but have failed and led to this crisis. Even for UP, there is still no clarity on how many farmers will qualify for the benefit. In rural UP, where three out of four households are dependent on agriculture, the state has seen a mere 2.9 per cent compounded growth rate in farming and allied sectors during the last decade, much lower than the national average of 3.7 per cent. Industrial growth has been hovering below 2 per cent for a decade, and the state was ranked 20 among 21 in the ease of doing business. Kanpur's leather industry has seen 146 of the 400 tanning units down shutters in the past decade. In Punjab, pharmaceutical units have moved out to Himachal Pradesh because of tax exemptions. The traditional hosiery and small business, too, has moved out to Madhya Pradesh and Haryana. In January this year, Assocham came out with a paper 'Action Agenda for New Government of Punjab'. It showed that the state's overall economic growth rate was at a low 4.9 per cent in 2014/15 compared to 10.2 per cent in 2006/07. It also pointed that Punjab's contribution to India's economy has declined from 3.3 per cent in 2004/05 to 2.9 per cent in 2015/16. The overwhelming verdict in the elections has been for change. One can only hope that the change is for the better.